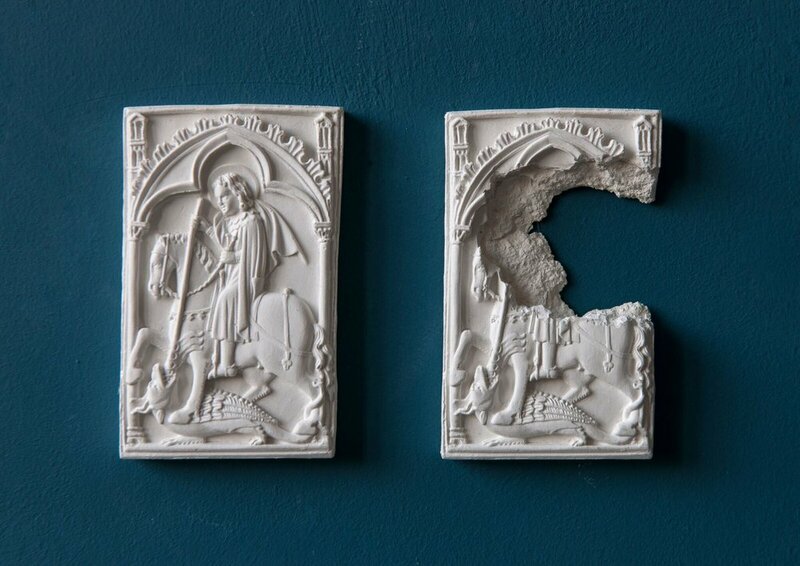 Piers Secunda’s ISIS Bullet Hole Paintings introduces a series of sculptures that merge molds of bullet holes he painstakingly gathered from cities under ISIS attack and forms of ancient Greek and Assyrian artworks. Artspeak editor Yasemin Vargi interviewed Secunda about his experience while working in regions destroyed by ISIS and his process coming to the exhibition. Yasemin Vargi: Your Chinese puzzle sculptures are entirely made out of paint, which should require significant patience and craftsmanship. Could you talk about the process of these works? Did you learn the skills while you were in China? Piers Secunda: The Chinese puzzle was really an exercise in increasing my paint carving and paint sculpting abilities. I just saw it as a challenge. The object itself is traditionally made out of ivory and it was a trade object made in China for a few centuries. It was exported predominantly to Europe, where it was just an object of intrigue, a keepsake which provided some sort of indecipherable link to what people in the West thought of as the mysteries of the orient. Wrapped up inside is literally a physical a puzzle so that metaphor ties itself into what the object was. It took two years to make the first one and lots of trials and lots of errors. I had to basically learn how to carve using a drilling tool. Ironically, in China they weren’t so willing to be contracted to make the object for somebody else. I got some help in England from people who spent years carving but the majority of it is exercise and practice. YV: How did you start incorporating geopolitics into your art? PS: I always thought very strongly that the most relevant thing that I can do as an artist is to either make a record of the time that I am living or make a statement about it. I didn’t sufficiently feel equipped to make a statement because there is always somebody who knows better. I have been making objects out of paint for a very long time and I thought I came to a point that I felt confident where I could make anything out of paint. I have been waiting for that moment to come so then I could bring the machinery of the real world in to the studio and make some sort of a record, the way that the world functions. YV: Your bullet hole works have a certain documentary quality to them. Each piece is like a piece of evidence displayed with your artistic input. Do you think the message in your works transform when you bring them into a gallery context? PS: No, actually it is less of a message and more of a forensic record I was able to produce. When they are in real world, they are bullet holes; when they are in an art gallery and combined with a work of art, they become an artistic interaction. Geopolitical damage, scars of violent activity, they are a part of the world which we live and that’s what I am attempting to paint, so in the tradition of figurative painting where you render the world into two dimensions, I am rendering the real world in my case in three dimensions. Putting them in a white wall gallery space, which I consider as a contemplative space where people who are never confronted with physical reality. I think of a gallery a little bit like a laboratory where you can go and experience the products of experiments of the art making process. That isolated white cube without the clutter of the world around them can make it a little bit easier to try to interact or understand. They can physically experience a forensic quality reproduction of what ISIS or Taliban do with no veil of the media in between. TV and movies unfortunately have a way of glamorizing physical realities. If that veil is not in between you and what you are seeing, then there is no getting away from it. I am bringing raw information into a painting context. YV: How do you pick the places you want to travel? PS: I have a list of places that I am interested in going to, however, I am married and I have a life together with my wife. I have to be careful where I go and I go to places where I can find dependable, reliable connections. I would like go to Nigeria, I want to do interesting work related to things there, but the connections have to be strong enough for me to feel comfortable. With Iraq, I made a connection through a university professor in England, he understood what I was trying to do and he had connections to Kurdish authorities. He was enthusiastic to help so it happened very quickly. There are many places that I want to go, but I am not able to because I haven’t found the way to go there safely. I never seek to get official permissions to go to these places because you just wait for years and years and it never really happens. YV: Could you talk about your experience in Iraq? How did you manage to get these bullet molds from the walls? PS: Very serious levels of security were needed there and I was moved around with the help of Kurdish authorities and Peshmerga. We went right up to do front line and couple of villages that have been recently liberated. They were still burning when we got there, everybody was wearing flat jackets. While I was molding the bullet holes, I was told not to move only step on the strip of concrete on the side of the building. For me the danger is not a problem because these events are the most significant things that are happening now. YV: What is it like to work with crude oil as an art medium? Do you plan on working with it for the remainder of your career? PS: The intention of the crude oil works is to tell the story of petro chemical age in pictures. I think that retrospectively the petro chemical age will be seen similarly to the Bronze Age and Ion Age. If you look at the end of the industrial revolution to the present day absolutely everything we do is facilitated by crude oil, the ultimate material in the world. And it can function as paint. I found that out quite quickly as I started experimenting with it. I started to reflect on what could be done with it that would carry some sort of poignancy and same as my intention with the bullet works to make a record of the time that I am living. So I am sort of thinking about how we arrived where we are and the developments that have occurred that are taking us from the industrial age to the present day. I am trying to portray this in images and using the crude oil that is relevant to the images. It is heavily research-based. It is a very effective paint medium; it looks like a mix of Hershey’s syrup and Coca Cola. They end up looking like sepia-toned photographs once the oil goes through the silk screen, which I really like. YV: What about the images of the oil wells? Is there an order for how you pick them? PS: I had bought the first bottle of crude oil that I got my hands on through Ebay and the oil came from a place in Pennsylvania called Drakes Well, which was the first commercially drilled well in the Western world. I thought historically it was an interesting place to start. If you read the history of the oil industry, it starts in Pennsylvania in the 1850s. I move forward through the timeline and start portraying the present day now and carry on. A lot of the images I use come from 1900s come from photo archives that are in public domain. Nowadays, I take a lot of images with my telephone and screen shots on my laptop. I am also interested in the way that the changes; images change as well as how we receive information. The media revolution that has happened in the last 20 years with the Internet is something that I will be portraying in the crude oil works in the future.